One thing I have learned, I mean really learned, is not to sell practicing and exercising short. While I know I have said this before, recently I have been increasing the amount and intensity of practicing facing my fears and exercising and let me tell you, I notice a difference. I have been recording the exercises and stretches that I have been doing to get through my anxiety and build self-confidence and I know that it is what is helping. Sometimes we need to prove to ourselves that we can get through our anxiety and that we do have the strength. Practicing and exercising consistently lets us realize that we do have the ability to get through our struggles. However, we cannot grow lazy and we cannot just practice once a day and then give up. We have to keep practicing, keep working hard. I’ve been asked if working hard and consistently is worth it and I know that it is. Never stop trying! I’ve felt wonderful the last few days and this morning, I accomplished something that made me feel great. I really believe I owe it to practicing and consistently working hard to get through my anxiety. You have the ability to get through your anxiety, you just have to keep practicing, exercising, and thinking positive! 1.) People who suffer from anxiety are not disabled, we are just like everyone else. Just because we may not deal with certain situations as well as others or just because we may be more anxious than others at times, does not make us abnormal in any way. Please do not treat us differently. Instead, show us respect and if you can, be there for us. 2.) If you have suffered with anxiety in the past and have gotten through it, you have done something amazing. However, please remember that there are still other people out there who struggle. Just as you probably wanted people to help you in your time of need, others out there need support as well. Please try to be understanding, there was a point when you went through this too. 3.) Just because you may be a fellow sufferer from anxiety, does not mean you do not have something positive to share with others who struggle. Just letting others know that they are not alone can be helpful and trying your hardest to help them get through their fears is even better. 4.) If you find it hard to understand how someone can suffer from anxiety so much, that’s okay. Just because it’s hard for you to imagine though, does not mean you can’t be helpful or at least kind to those who do struggle. 5.) Chances are that if someone says they suffer from anxiety, panic attacks, depression, etc. that they do. Just because you don’t suffer from it or struggle with it, does not mean that others are making up that they deal with that issue. Anxiety is a real issue that is often times very difficult to get through. 6.) For those who struggle with anxiety and have people around them who care and offer support, remember to thank them. These people are wonderful and not everybody is willing to help. **I would like to thank everybody that reads, posts, likes, and follows this blog. I would also like to thank my family and friends for helping me through my anxiety and being there for me. Also, I’d like to thank anyone who helps someone who suffers from anxiety or another issue. 1.) Knowing that you have goals gives you something specific to work towards. It’s one thing to say, “I’m working towards getting through my anxiety” and it’s another thing to say, “I have these steps that I’m going to follow in order to work through my anxiety”. Having specific goals that you can work on helps you see that you can in fact get through your anxiety. Specific goals also gives you a good guideline on how to get through your anxiety. 2.) Accomplishing your goals helps you feel good about yourself and helps you to see that you are making progress. 3.) Setting goals gives you something to look forward to. When you wake up in the morning, you feel motivated to work hard. Working hard is important when you want to free yourself from something that is taking control of your life. 4.) Working hard to reach our goals teaches us responsibility, something we all need in the real world. We all have the strength to get through our anxiety. Getting through anxiety is not a question of whether we are strong or weak, but rather a question of whether or not we do all that we can to get through it. I really believe that we all have the ability to face our fears and that the only reason we may feel otherwise is because, at that moment, our anxiety makes us feel otherwise. In addition, as I have mentioned before, when we are dealing with anxiety, we tend to focus on the negative instead of the times when we have managed to get through our fears. Many times we also tend to forget all of the progress that we have made and how well we have done when we have practiced and exercised. Practicing and exercising makes us stronger not only physically, but mentally as well. Practicing also proves to us that we can get through our anxiety and that we can trust ourselves. We are strong, we just have to use that strength so that anxiety does not take over our lives. Today was slightly upsetting for me, but I did learn something essential. Anxiety, as I’ve known for a long time now, has the tendency to take away from one’s life at times. Also, while many of us know the importance of practicing and exercising in order to get through anxiety, we tend to come up with excuses or reasons not to practice. Whether or not these reasons are valid is not always important. What is important is the fact that if you want to return to a life that is not controlled by anxiety, practicing and exercising, along with taking steps to overcome and get through your anxiety, should be your top priority. As someone said to me today, “Everything else is secondary”. So try your hardest to practice and exercise consistently and you will see progress. As a person who suffers from anxiety, I have come to learn that sometimes in life, we have to deal with our anxiety and try to work through it. In other words, we cannot always simply make it disappear or ignore it because sometimes, it has a strength over us that at the moment seems too hard to simply ignore or make vanish. Take this morning, for example. I was trying to do something and I became anxious, I needed to take a break. However, I didn’t ask for help and I didn’t quit. I knew what needed to be done and I slowly worked through it. Do I wish that I could have done the task with more ease and without anxiety? Of course! However, the fact of the matter is that I got anxious and I knew I had to work through it somehow…so I did. As I’ve mentioned in the past, taking breaks is okay. Sometimes when we are dealing with anxiety, we need to rest and reassure ourselves that we can get through our struggles. We don’t always have to do everything at once. As long as we vow never to give up, we can get through our anxiety and overcome it. Also, there’s nothing wrong with asking for help from those you trust. Just remember that in the end, the goal is to trust yourself. As many of us who suffer from anxiety have come to learn, some days are more difficult than others. Sometimes we challenge ourselves and find that we are successful in facing our anxiety with minimal suffering and other times, we find ourselves struggling to fight the controlling power of fear. When we end up feeling as if we didn’t do as well as we could have, memories of the fact that we often let fear get the better of us begin to surface. Suddenly we begin to dwell on the negative and we may even wonder if we’ll ever conquer our anxiety. Today was one of those days for me. I tried to get through something and while I did pretty well for the most part, I struggled at the end and felt miserable. I started to remember how I was before anxiety was such a big part of my life and I started wondering if I’d ever get through this since for so long, I’ve been struggling. Then someone important to me reminded me that I have gotten better. The person was right, a year ago I wasn’t doing as well as I am now. While every day may not be easy, there are definitely times when I’m doing better than I was before. Sometimes memories of these times of progress just seem to fade from our minds in the presence of disappointment in ourselves. However, nothing can take away the fact that we have made progress. Even if you don’t feel you’ve made progress yet, you will as long as you continue to practice facing your fears in small steps. 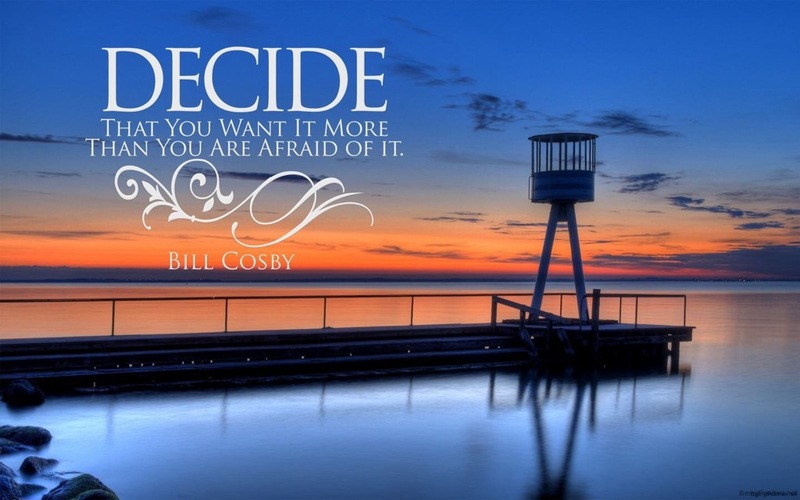 The quote that I used as the title of today’s post is a quote I found by Bill Cosby. It is inspirational, in my opinion, because sometimes we are so worried to try and face our fears, that sometimes we don’t even try. However, especially with someone around that we trust that is willing to help us, we need to decide that living a life where anxiety does not control our life is something we want so much that we are willing to practice facing some of our fears. **Please note that I have put this quote on my post because I find the quote inspirational, not Bill Cosby himself. I know that I often give tips on how to get through anxiety, but I thought I would add some to my usual ones. If anyone would like to contribute some others, I would greatly appreciate it. 1.) Practice Consistently- This isn’t always easy, but it’s important. If you constantly practice facing your anxiety (in small steps), you will be able to prove that you can trust yourself and that your anxiety doesn’t have to control you. 2.) Try To Do Something Every Day That’s Out Of Your Comfort Zone- Even if it’s something small, doing something each day that’s out of your comfort zone can help you show yourself that you are okay and that you can succeed. You also exercise your mind. 3.) Exercise Consistently- Exercising both physically and mentally helps you gain strength. Exercising works like facing your fears does; it makes you stronger so that you can overcome any obstacles that come your way. You don’t have to do complex exercises to be successful, just some stretches each day can help. For some exercise tips, visit, http://www.satorisisters.com. (Please always stay safe when exercising). 4.) Come Up With A Mantra- Come up with a saying that will help you when you get anxious. For a while, I couldn’t think of one I liked. However, after watching The Stand by Steven King, I liked the quote that talks about whether or not you believe in God, He believes in you. Even for those of who you aren’t religious, the quote can be very helpful. However, it is important that you find a quote that is positive, uplifting, and that will help you. 5.) Share Your Feelings With Those You Can Trust- Talking to people you trust about your anxiety can remind you that others are there for you. Also, remember that you are not alone in your struggles. **Once again, I invite you all who have ideas or suggestions on getting through anxiety, to offer your advice. Thank you. So while anxiety is never a good feeling and is something that I definitely don’t enjoy, I am happy that I chose to write this blog. I have officially been on WordPress now for a year and would like to talk about what I am grateful for when it comes to writing this blog. 1.) I am grateful for being able to interact with people that also find themselves struggling with anxiety (Mary, Elle, Izzy, Becky, etc). You guys have not only helped me realize that I am not alone in my struggles, but you have given me advice as well. Mary, you have helped me so much and you even inspired me to write this post stating why am so happy I started this blog. Thank you to everybody who has supported me in my fight against anxiety. 2.) I am also grateful that I started this blog because it has assisted me in realizing what helps me get through anxiety and just how important it is to practice consistently. 3.) I’ve also enjoyed helping others and before I started this blog, I didn’t realize just how helpful sharing my experiences would be. Since it would be a lot of writing to list everyone I “follow”, I suggest that you all go to the top of my blog and see who I am following. These are some of the people who have helped me with my anxiety and have been there for me, even if it wasn’t in person. I am grateful for all of these people. Thank you. Additionally, I hope reading this post will remind everyone the importance of practicing consistently and knowing that you are not alone in your struggles. Also, while you need to be careful when it comes to who you trust and be careful that you don’t give out too much information, you should try to find people that you can share your experiences with. Sometimes we find that when we really want to do something and we think that it won’t be that hard, it ends up being slightly more difficult due to our anxiety. However, sometimes we still manage to get through it. Today I wanted to experiment with something and while it didn’t turn out exactly how I wanted, it was worth it. Why was it worth it? It was worth it because I faced my anxiety in order to try and accomplish something and you know what? I didn’t do so bad when it came to getting through my fears! Sure I had some help from a family member but I thought I would get so much more anxious than I actually did. Also, while the person who helped me wasn’t as kind as I would have hoped, I still managed to try my hardest to get through what I needed to. Every day so far for the last four days, I’ve been trying to do things that I don’t usually do. I’ve found that trying these things and succeeding is a great way to prove to yourself that you can overcome your anxiety instead of letting it control you. The new thing you try each day doesn’t have to be something huge, it just has to be something that helps you practice get through your fears. Also, even if you don’t succeed, necessarily, you still tried! I wish you all the best!